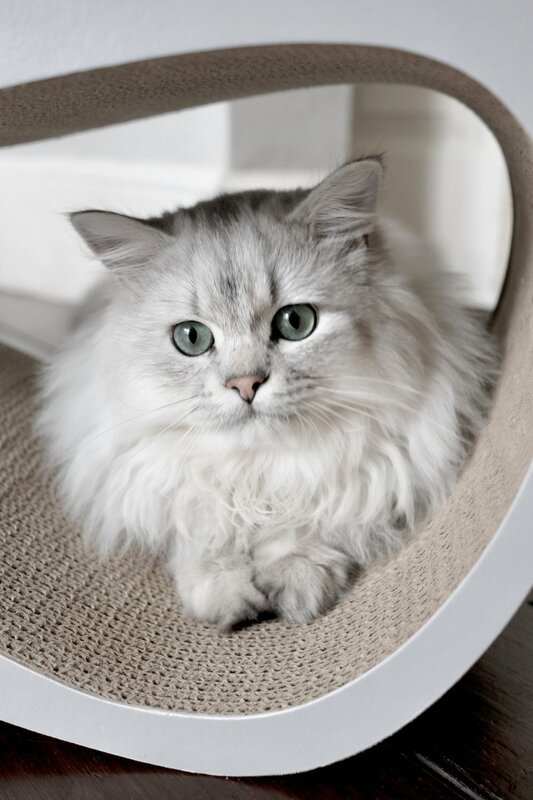 A few months ago, I discovered the Poland based cat furniture company My Kotty. Firstly, I never knew that there were such things at well designed cat furniture companies! My Kotty believes that functionality and style should go hand in hand. I look at design in exactly the same way, so it was nice to see that I could extend that to Claude, my now 8 month old Siberian kitten. When were first got Claude, I browsed Amazon and the internet for hours, looking for the best scratching posts and cat toys. They all looked very conventional and 'cat toy' like but I went for it anyway as I wanted to avoid any claw marks in our sofa. A couple of months in and I realised that Claude wasn't that interested in the generic rope scratcher as he's been getting big very quickly and it's just too flimsy for him. He needed something where he could really stretch out and get his claws dug deep. Claude got to try out the Lui scratcher and Vigo scratcher the former being his favourite. I of course chose the grey model so that it would fit seamlessly in the house. Both are beautifully designed, with soft curves and minimal design. Made of corrugated cardboard, it's extremely light which means it can easily be moved from one room to the next to fit Claude's mood. The cardboard always feels really warm and cosy to touch, so Claude loves sleeping on it as well as using it to stretch on. I'll often find him curled in the middle bit of the Lui version. For that added cosyness, we also tried out the Fibi blanket. Made of faux fur, it's extremely soft to touch and cosy. It also looks really beautiful and could easily be mistaken for a sofa throw. The collection ranges from £29.95 for the Vigo through to £49.95 for the Lui. The Fibi blanket is £21.95 and mashing washable too. All images taken by me and all thoughts and words my own.